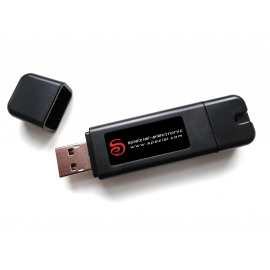 Industrial Bluetooth Smart Ready 4.0 USB Stick with internal Bluetooth Stack. Certified for Europe, USA, Canada, Japan, Australia and Brazil. Black matte finished polycarbonate housing. UBT21 is an industrial bluetooth stick built to simplify and optimise the communication between industrial products and personal computers (Windows, Mac, Linux). Using UBT21, the end user will be enabled to transfer data from or to the machine, transmit commands or do maintenance over a distance of up to 300 meter at temperatures ranging from -30° to 70°C. The end user does no longer need a separate bluetooth stack on the PC - just an interface driver needs to be installed to the computer and the stick is ready to go. UBT21, in comparison to the on board interfaces of the PC, allows you to transfer data much more reliable and stable. UBT21 gives you the full control over your data connection. UBT21 is based on the OBS421 Bluetooth Smart Ready Module, developed and manufactured by the Swiss company u-blox. As an industrial product, UBT21 guarantees a long life cycle. It is certified for use in: Europe, Canada, USA, Japan, Australia and Brazil. It also complies with the Medical EMC standards. UBT21 adds value to your product by optimising the communication to external computers and simultaneously lowers your expenses for maintenance of your products in the field.